A sweet little holiday cottage or first time home with beautiful features. This is not a stacking house like Applewood Cottage or Copperbeech Lodge. 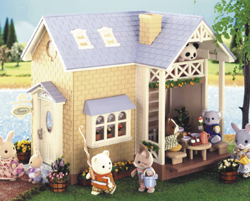 Set includes house, penguin family and children's bedroom furniture. Figures & furniture in main picture not included.